Before I started eating a healing diet, I was pretty boring with spices. You’d be lucky if you found me using anything more than just a scant amount of salt. My palette was so off from eating so much artificially flavored food and refined carbohydrates my whole life, I just didn’t understand the need for spices and herbs. Today, I love using interesting spices in my everyday cooking. 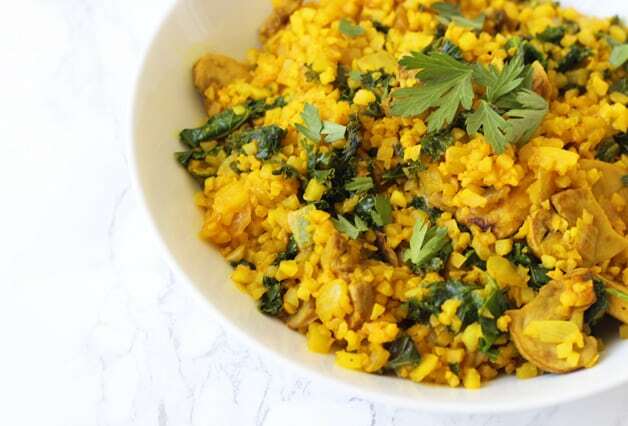 Not only does it add some flair to otherwise pretty straight forward dishes, but they come with added nutrient and health benefits… especially turmeric! I’m always preaching adding in more veggies and healing foods, and have been wanting to highlight some more turmeric in my savory dishes. 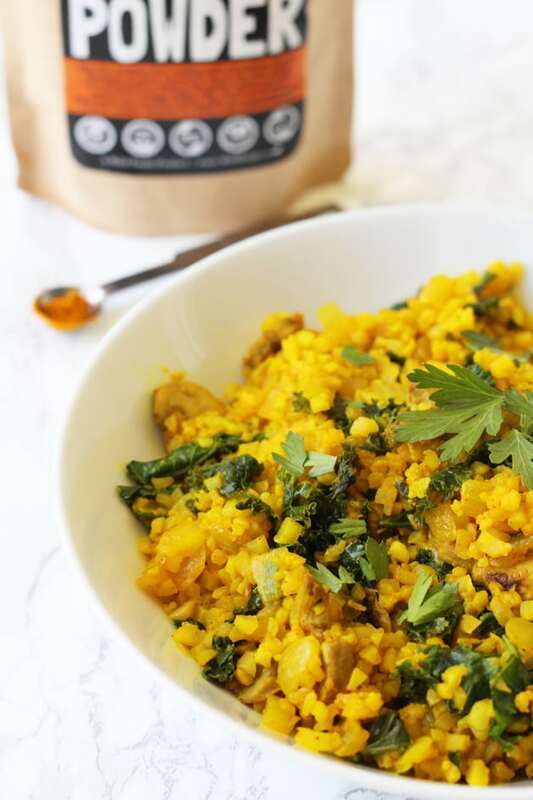 And, this Turmeric Cauliflower Risotto is the perfect dish if you’re going for flavor and nutrient density! Turmeric is a traditional spice known for aiding the natural anti-inflammatory processes in the body. Rather than unnatural over the counter anti-inflammatory drugs, turmeric is natural and does not interfere with your immune system. Whenever I get sick, I’m always reaching for turmeric to add to my soup to help my body fight inflammation! It can also be helpful in joint pain, migraines, and calming other inflammation. Oxidative stress in the body is a massive contributor to chronic illness. Our cells can be under stress for a variety of reasons, and keeping up our antioxidant status helps our cell right off free radicals. Curcumin in turmeric is known to be a powerful antioxidant to help protect our cells (source)! 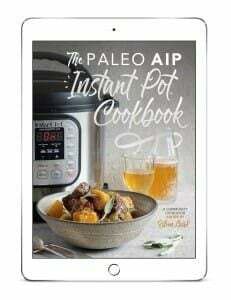 I cook with turmeric often and have used it in my anti-inflammatory turmeric bites, carrot turmeric spring soup, mango turmeric ice-cream, and lots of everyday cooking. It’s packed with flavor, and adds amazing color to dishes as well! The brand that I used in this recipe, and the one that I recommend using is Wild Foods Co. turmeric powder . It’s organically grown turmeric from India, with amazing color and flavor! Wild Foods Co. has a myriad of organic, non-GMO ingredients, and this quickly became my favorite. Lots of stores, like Trader Joes, Whole Foods, and Sprouts, have begun carry pre-riced cauliflower which is easily one of my favorite convenience foods! If you can’t buy it pre-riced, you can easily rice it in a food processor, like this. Mushrooms and onion add more flavor and nutrients to this dish. You can always try experimenting leaving ingredients out if you’re sensitive, but they really help contribute a lot of flavor to this dish. Ahh, bone broth. You guys know I love bone broth. 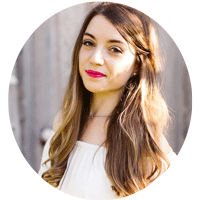 Bone broth is another powerhouse ingredient in this recipe, and full of gut healing nutrients. You can find my recipe for homemade bone broth here. Melt the coconut oil in a deep skillet on medium heat. Add the yellow onion and saute until the soft and transparent. Stir in the garlic and cook for 1-2 minutes. Add in the mushrooms and kale and saute for 3-4 minutes or until soft. Pour in the broth, and cauliflower rice and season with salt, pepper and turmeric. Stir to ensure they’re evenly combined. Reduce heat to medium-low and allow to simmer for for 8-10 minutes or until the broth is mostly absorbed by the cauliflower. Remove from heat and place in a serving bowl. Top with fresh parsley and extra salt to taste if desired. I hope you enjoy this nutrient packed dish! Eat it as a side dish, or add in some chicken to make it a fully rounded out meal. Enjoy!! I made this recipe for dinner tonight with some chicken and green beans and it was so delicious! The recipe was pretty straight-forward, but a little more fancy (or at least I felt fancy with the different browning steps haha). Overall, great taste and flavor; can’t wait till tomorrow to eat another serving!! Made this as a side to some lemon garlic and turmeric drumsticks made in the IP. It was fantastic! Added some lemon and castelvetrano olives in place of mushrooms. Only had chicken bone broth and frozen kale and still worked quite well! Yay!! Thank you so much, Lauren!! I’m SO happy you liked it! Would you say that leftovers are freezable? You can try, but it may get a little mushy when you defrost. Let me know if it works!